The league has succeeded in generating Objectively More Attractive football in 2016, with fewer stoppages and higher scores. Good! But will the League stick to their guns on the new rules? I think it’s safe to assume that the interchange cap won’t go back up, as that’s a clear-cut rule that isn’t subject to interpretation. The tighter interpretation of the deliberate out-of-bounds rule, on the other hand, is just the sort of thing that might get wound back over time. This sort of thing has happened in the past many, many times. Remember the spate of ‘kicking in danger’ calls after that rule was first introduced? The rule remains on the books, but is rarely called. In part, that’s probably due to players refraining from swinging their boots in the vicinity of other players’ heads, but I think it’s also due to a kind of faddishness in umpiring. 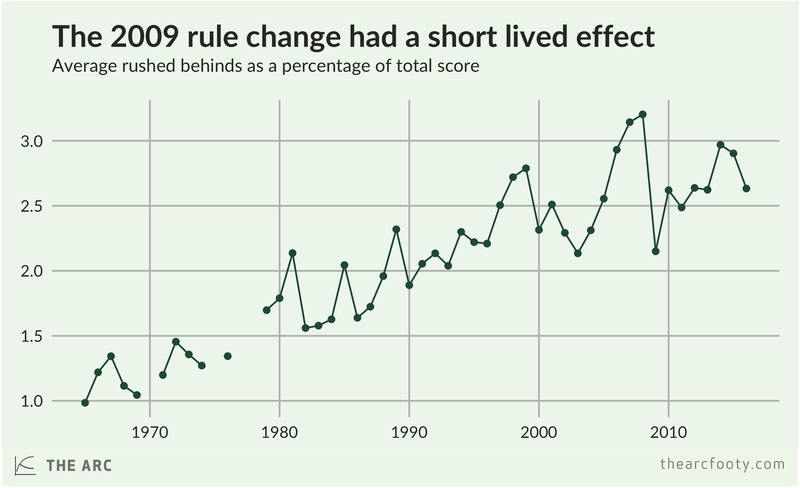 Another example of a rule change being slowly wound back is the deliberate rushed behind rule. As I’m sure you remember, players used to be able to carry or knock the ball through their defensive goals, thereby conceding a point but gaining clear possession of the ball. This was an accepted part of the game. But through the late 2000s, teams started using this as a deliberate tactic, and rushed behinds rose from about 4 per game in 2003 to a touch over 6 per game in 2008. Hawthorn used the tactic to great effect in its Grand Final win against Geelong, widely seen as the better team at the time, and the League responded by impetuously changing the rules to outlaw ‘deliberate’ rushed behinds. The rule change worked. In 2009, the average rushed behinds fell to 3.7 per game. You can see the distribution of rushed behinds per game in the seasons immediately before and after the rule change in the graph below. But the effect was short-lived. 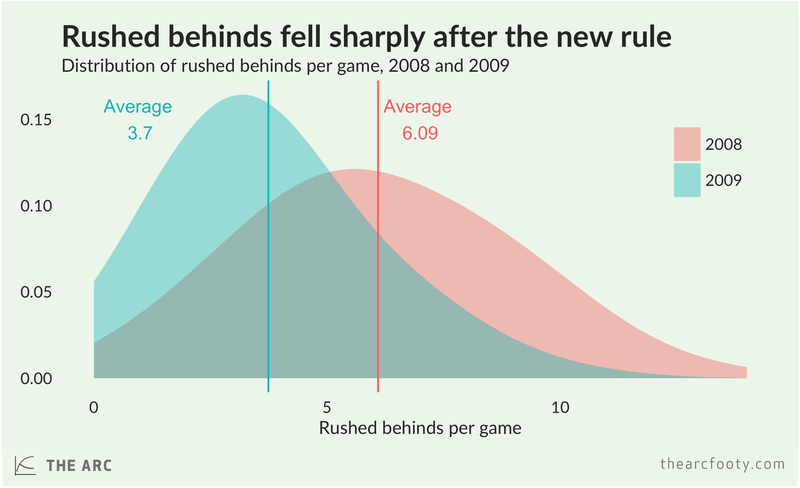 After plummeting in 2009, the average number of rushed behinds started rising in 2010, settling at around 5 per game in the past few years. The resurgence of the rushed behind is even clearer if we look at rushed behinds as a percentage of total scores. Of course, it’s possible that the interpretation of the rule has stayed completely consistent since 2009, but players are just recording more ‘genuine’ rushed behinds. But I doubt that’s the whole story. Instead, I think (but can’t prove) that the return of the rushed behind is due to a combination of looser umpiring and more skillful concealment of intent by players. The story of the rushed behind rule gives us good reason to wonder whether the League will stick to its guns on the new deliberate out-of-bounds interpretation. 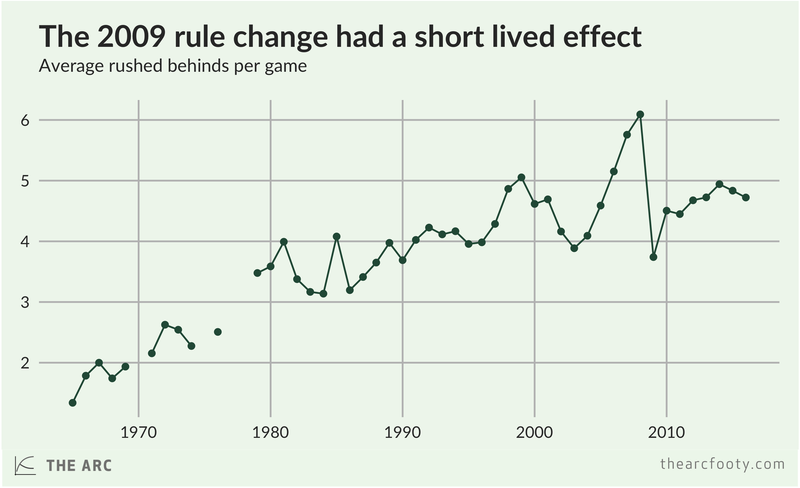 Like the rushed behind rule, the recent change introduced even more ambiguity and uncertainty into a game that already has too much of both, because it calls on umpires to somehow infer precisely what a player intended to do, rather than just observing what was actually done. I wouldn’t be surprised to look back in a few years and discover that 2016 was the high-water mark for the deliberate out-of-bounds call. Previous article	← The goals are back in town.